There’s an element of prestige and honor in becoming a physician, that is afforded by very few other professions. Making these skills very in demand and this demand will only increase as more Americans get health insurance, the population ages and since a projected 117 million Americans live with chronic diseases they’ll need care and medical intervention. By the time you’ve completed studying you’ll have joined one of the most distinguished professions in America. One of the highest paid professions as well. In fact, as of 2018 the average annual income of physicians spanning all specializations was $299,000. 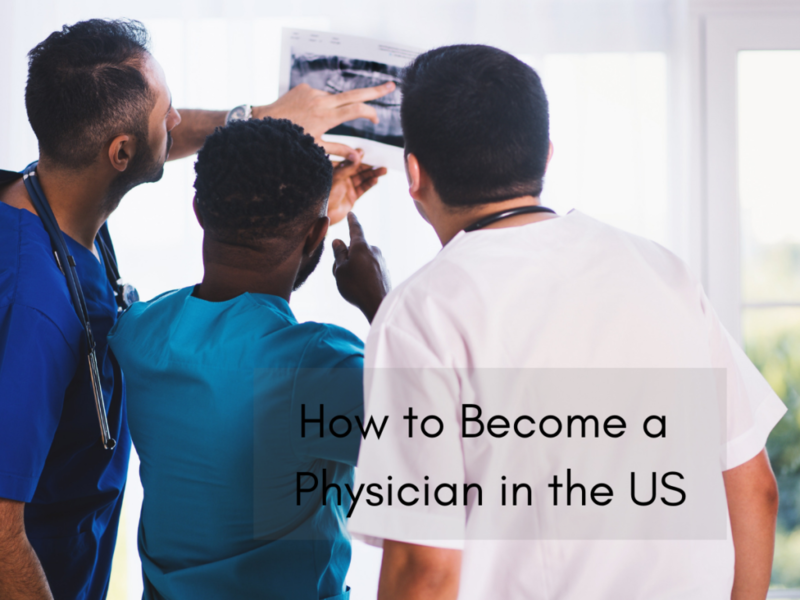 Therefore, if you’re thinking of becoming a physician you’ll need to be committed to studying and completing several steps before you’re able to join the 1.1 million physicians in America. However, once you’ve completed the steps outlined in this post you’ll be joining one of the most lucrative and fulfilling professions in the world. Helping people live their best lives everyday. But, before you dive in, you should determine whether you have the characteristics required to become a physician. Breaking bad news to patients has to be one of the most difficult aspects of the job, but it is an aspect you’ll have to face regularly. To do your job as a doctor you’ll need to have levels of emotional stability that will see you through these times. Working on your feet all day in a physically and emotionally demanding job means you’ll have to be able to manage stress easily. If you’re thinking of going into medicine you should first determine how well you deal with stress and pressurized situations. If you want your patients and fellow doctors to be forthcoming you need to be compassionate and humble. This way you’ll always be approachable. Remember, that in the field of medicine you’re constantly learning, and if you’re open to learning you’ll make fewer mistakes and continue to grow in this profession. Becoming a physician is not about the salary or the prestige but about improving the lives of others. The long hours and exhaustive work will be worth it if you have a passion for what you do. Before you can apply to medical school you’ll have to complete your bachelors degree from a licensed and recognized university. There are no rules in place regarding what major to take before applying to medical school, however, popular majors include Biological Sciences, Social Sciences, Physical Sciences and Humanities. A prerequisite to getting into med school is to pass the MCAT (Medical College Admission Test). Which is a standardized multiple choice exam that assesses your likelihood to succeed in a medical program. The Association of American Medical Colleges puts the average MCAT score at between 510 and 511 and an average GPA of 3.71 in successful applicants. When you decide to apply for medical school is completely up to you, but most students apply in the summer of their junior year in college. That said, applying through AMCAS is the most efficient method as you’re able to select the Med schools you’re applying to and this centralized database will send your application to each school. Medical school requires four years of full time study to complete, and is divided into two core elements. The first two years will be spent in labs and classrooms and the last two years you’ll gain practical knowledge of medicine under the watchful eye of a physician. During your time at medical school you’ll be required to pass the USMLE if you want to practice medicine legally. This is a three part examination. Of which you’ll participate in the first exam in your first three years at med school, and the second part in your fourth year of med school. In your final year, you’ll begin narrowing down your residency options based on what you plan on specializing in. You’ll submit an application for residency and will be matched with available residencies throughout the country. Once you’ve graduated from Med school you’ll begin your residency, which takes between three and seven years to complete – depending on your field of medicine. During your residency you’ll be required to take the final exam in the USMLE. This exam assesses a doctor’s ability to practice medicine safely and effectively. Board certification isn’t necessary to practice medicine, however, it does show proficiency in your area of specialization – and is recommended. However, being licensed by the state is a requirement, hence you’ll need to get a state medical license in the state you’ll be practicing in. After all this hard work you’ll finally be a practicing doctor, and will be able to apply for some very fulfilling jobs. You should find the right job portal to apply through, and be ready to find your dream job. Looking for a Physician Job? Are you already a Physician and are searching for Physician Jobs in Florida or Physician Jobs in the US? Please contact us today and our experience Physician Recruiters will help you to find the right Physician Job!